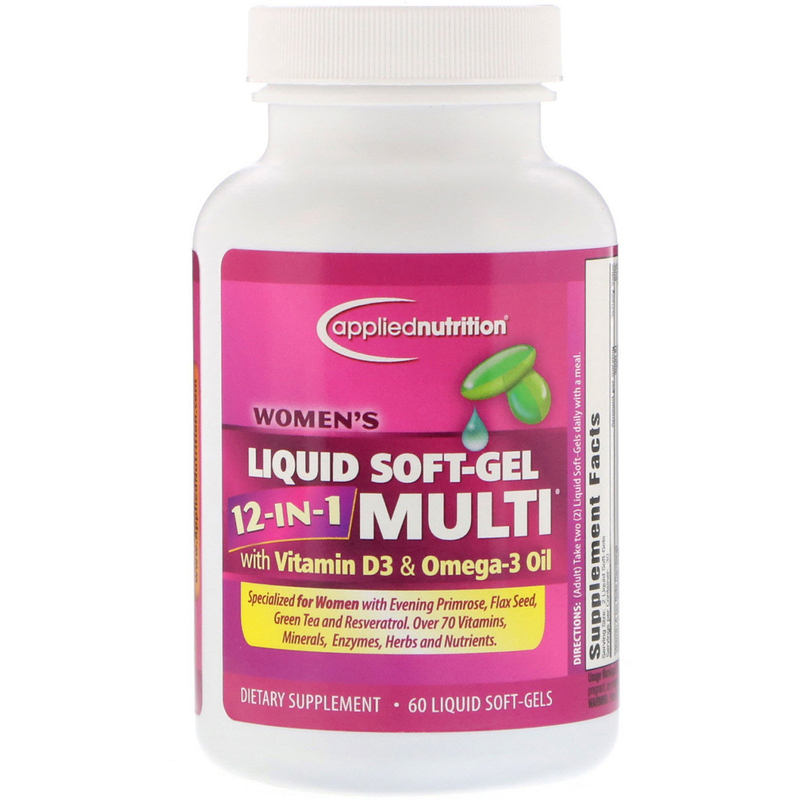 Women have specific nutritional needs, requiring more than just an ordinary multivitamin. 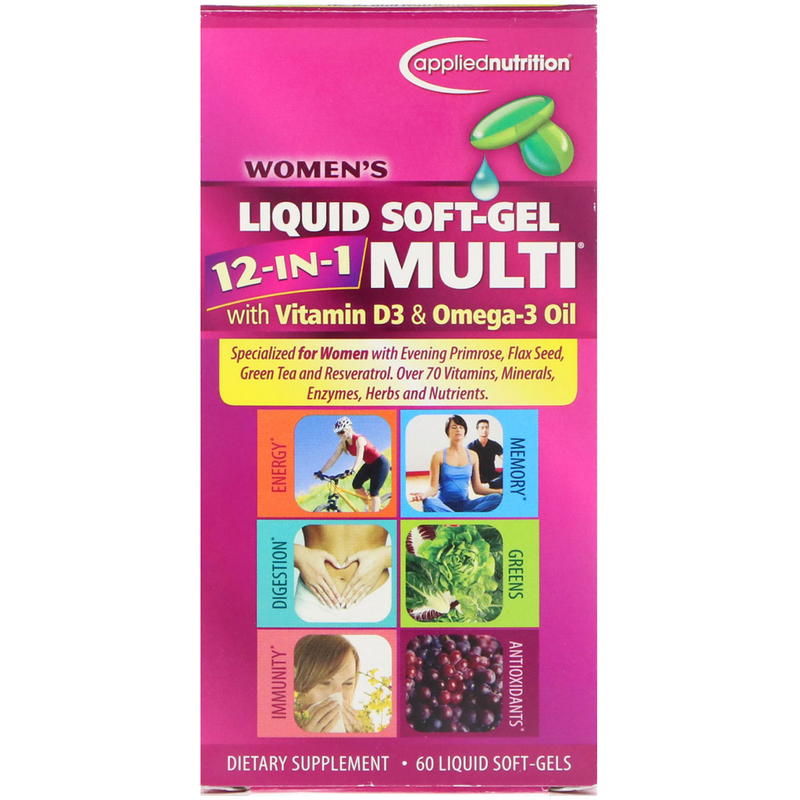 Women’s Liquid Soft-Gel 12-in-1 Multi is a unique combination of vitamins, minerals and 10 targeted blends that support women's health. This comprehensive formula is packed with powerful nutrients, herbs and enzymes plus beneficial oils that cannot be delivered in an ordinary tablet. Key ingredients include Vitamin D3, Green Tea, Resveratrol and full-spectrum digestive enzymes. For added benefit, we've also included Evening Primrose Oil, Flax Seed Oil, Black Cohosh and Chaste Tree. Unlike hard-to- digest tablets, our formula is delivered in fast-acting liquid soft-gels. This preferred delivery system allows nutrients to be released fast for optimum results. Comprehensive multivitamin and mineral formula, enhanced with nutrient-dense blends and beneficial oils. Designed specifically for women, in fast-acting Liquid Soft-Gels. Antioxidants - Vitamins A, C and E plus a powerful blend of Grape Seed Extract, Resveratrol & Blueberry help to fight cell-damaging free radicals. Energy - B Vitamins help to support cellular energy production. Enhanced with Asian and American Ginseng. Digestion - Full-spectrum of digestive enzymes help to promote the breakdown of carbohydrates, fats, protein and dairy. Immunity - Vitamin C and Zinc help to boost your immune response throughout all four seasons. Enhanced with Cat's Claw and Garlic. Memory - Powerful brain boosters like Vitamin B12 and Vitamin D3 support healthy brain function. 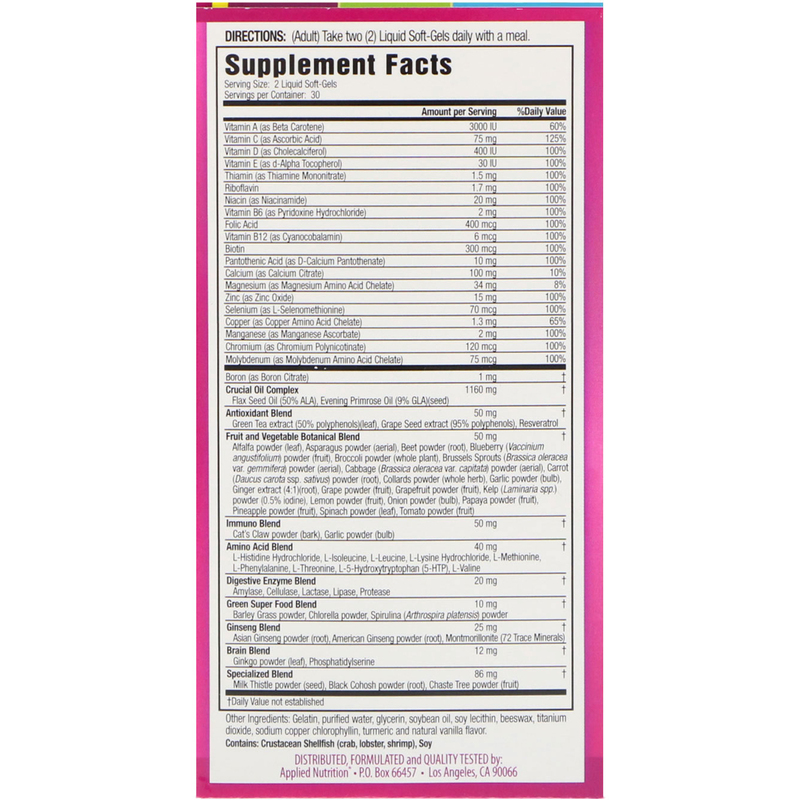 This formula is enhanced with Ginkgo Biloba and Phosphatidylserine. Greens - This diverse array of Super Greens supplies your body with plant-based nutrients sourced from whole foods such as Chlorella, Spirulina and Kelp. Gelatina, agua purificada, glicerina, aceite de soja, lecitina de soja, cera de abejas, dióxido de titanio, clorofilina sódica de cobre, cúrcuma y sabor a vainilla natural. Contiene : Crustáceos, mariscos (cangrejo, langosta, camarón), soja.